This tour is part of our workout series, for riders who like climbing, on bikes. Enjoy views from the peaks of some of Los Angeles's hills and Hollywood mountains. With amazing views of the Downtown Los Angeles’ sky line, Glendale, Burbank, Studio City, Hollywood, Century City, and as far as the eye can see. We start our first strecth with a slight incline and begin our first climb. At some point, we will stop to watch the sun rise and take pictures. We will also talk about the history and landscape of all the places we ride through. If you like riding down hills, this tour has a few nice drops. At some point we will ride on the LA River for a nice stretch of flat paved trail, where we could push it to the limit and sprint for a few miles. We will then get off the path and do a little "off road" riding on a dirt path with a few climbs as we make our way to the "Old Los Angeles Zoo". 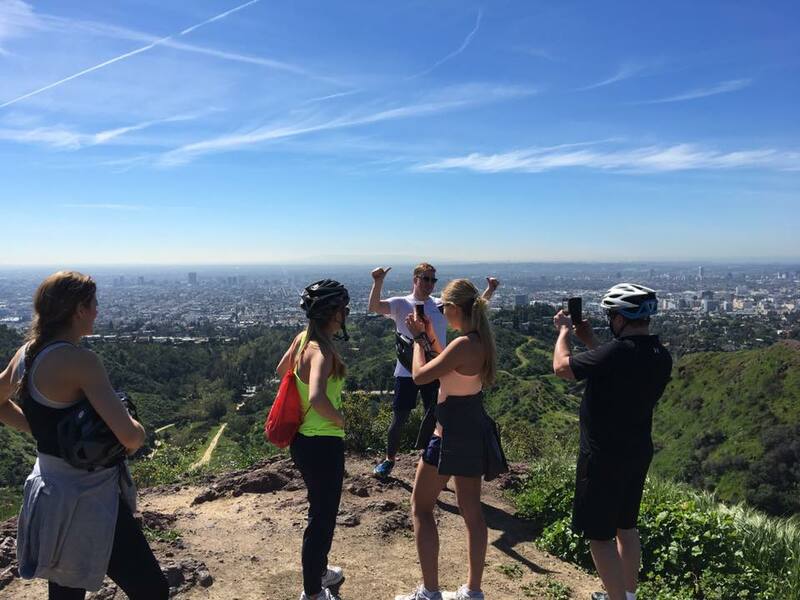 After that, we will ride past other iconic sites in the Griffith Park area and then we will jump on an old fire road and begin some more climbing with beautiful views of the surrounding cities. We will reach the Mt. 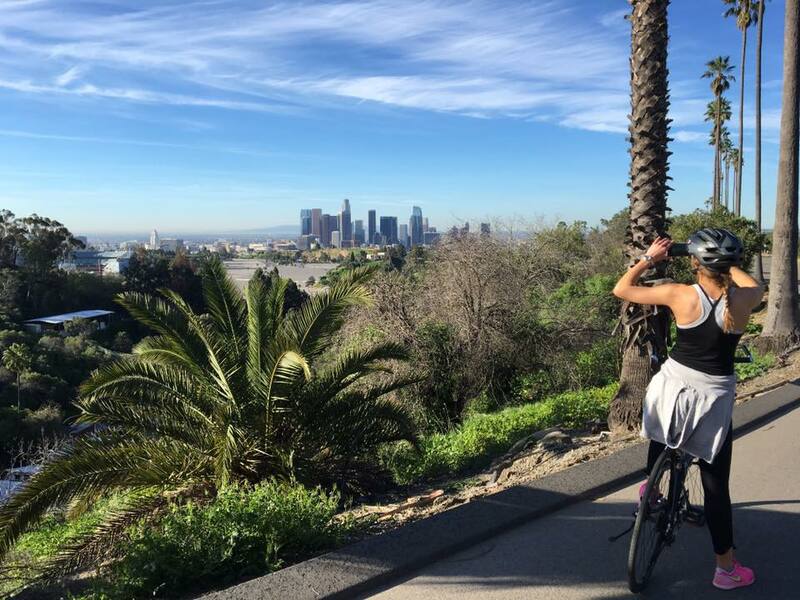 Hollywood peak (2,450 feet elevation) and stop to take in the views of our beautiful city. From here you can see all the way out to the beach or Catalina Island on a clear day. From here you can also see the Hollywood sign and the Hollywood mountains and mansions. Before we start heading down the hill, we will make a stop at the Griffith Observatory and ride past the famous Griffith tunnel. From here we can decide what route to take back to the start. If you want to keep pedaling, we can continue to climb some more and visit the famous "Bat Cave" in Bronson Canyon. We can also visit the Hollywood strip and check out the Hollywood walk of fame before we start making our way back to the start. On our way back to the start we will ride through some small streets with beautiful architecture and ride past a bunch of Los Angeles hot spots. We will ride past neighborhood's like; Little Armenia, Thai Town, Silverlake, Echo Park, Angelino Heights and back to our start point. Expect lots of climbing through back roads and trails. If you’re looking for a fun, fast paced, challenging, and informational tour then this is it. Get your work out while enjoying the urban landscape. (41k to 59k) in total distance. Expect a few stops and lots of perfect scenic photo opportunities. Don't see a date that fits your schedule? No problem! Contact us to set up a custom tour just for you!